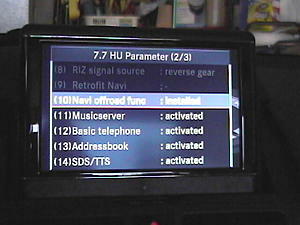 I have the Nav/Audio system with the folding screen, and my "engineering menu" looks completely different. It seems to only offer viewing of settings, software versions, etc, but no option to make any changes. Also, although the header of the screen says page 1/2, there doesn't seem to be any way to get to page 2. And there is no Return button - the only way I could figure out how to get back to standard mode is to shut off the system and then turn it on again. you have to push the controller towards the back seats to get to page two. to exit the menu, click down to page 2 and exit is the last option. when you first enter, select an option by clicking down, and then selecting sub-menus within. to get back to the root menu, click back, and to exit, go to page two of the root menu and select the last option. Does anybody know where it is???????? Actually almost every option that is not grayed out can be altered, when you click on them with the console switch they will show you the options - notice on this page in pic, the selections that are no lighted cannot be accessed witout SCN coding with StarDiagrnosis and being online with MBZ, the other 5 lighted options can be selected and altered. - do not mess with Update unless you have the DVDs to perform that update. Last edited by Nuru; 05-05-2009 at 10:31 PM. same here. Could not find it in COMAND system how to increase the MAX volume. Maybe it is already at Max Volume? Yeah there is no option that I could find for the MM package Engineering Mode. 1980's no way, that is a 1920's or 1930's slide dial look. its too bad such a nice car and that display. IMO, the W204 COMAND is soo dated - who in the world uses pcmcia slots? no rds traffic in the US? no hd radio? To add insult to injury, the overall GUI looks lame. PCMCIA slots are great, lets you use any kind of memory card you want, what do you think it should be instead?? Whats wrong with the GUI, is it lame just because its simple and easy to use? I have been thinking about trying to get MBZ to give me the Tour DVD. Think they might do it? TMC doesn't work in Australia. Correct me if i am wrong. According to the latest info I was able to find from TMC Forum it should be arriving at 2007 to Australia. The alarming issue is that they have last time updated this info at 2004. Probably some better source would exist today. Currently TMC is provided by this company via FM frequence (encrypted ) is that why Comand can't receive the singal and possibly a future firmware update could fix it? In this case MB would have to release a map update that would include the necessary data for your local TMC info and pay the licence. This sometimes takes a long time and nothing guarantees that MB would make the service available. In Europe they have done it for all countries that have introduced encrypted traffic info but it has often taken a couple of years. Pressed Update button by mistake. I've pressed an update button by mistake, and was asked for a CD. I turned Comand off but had to do a few Power Ups and Downs before this screen cleared. Heve I messeed up something?